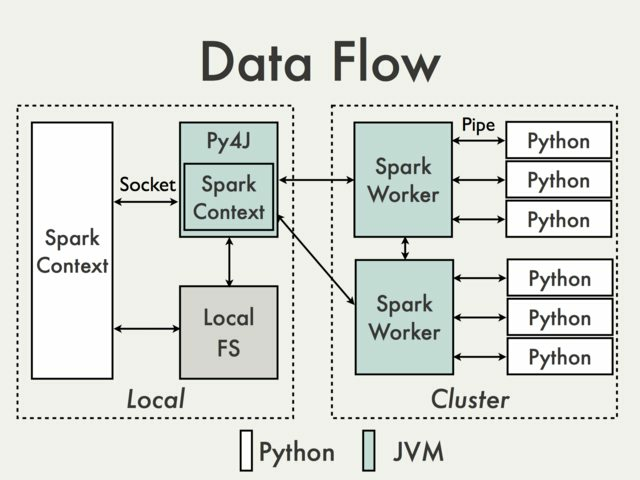 PySpark Internals - Spark - Apache Software Foundation for your Wiki! NOTE: This Wiki is obsolete as of November 2016 and is retained for reference only. In the Python driver program, SparkContext uses Py4J to launch a JVM and create a JavaSparkContext. Py4J is only used on the driver for local communication between the Python and Java SparkContext objects; large data transfers are performed through a different mechanism. RDD transformations in Python are mapped to transformations on PythonRDD objects in Java. On remote worker machines, PythonRDD objects launch Python subprocesses and communicate with them using pipes, sending the user's code and the data to be processed. PySpark's tests are a mixture of doctests and unittests. The doctests serve as simple usage examples and are a lightweight way to test new RDD transformations and actions. The unittests are used for more involved testing, such as testing job cancellation. To run the entire PySpark test suite, run ./python/run-tests. When adding a new file that contains doctests or unittests, make sure to update run-tests so that the new tests are automatically executed by Jenkins. For unittest suites run SPARK_TESTING=1 ./bin/pyspark python/pyspark/my_file.py. Some of our doctest suites (such as the tests in rdd.py) have a custom __main__ method that sets up a global SparkContext that's shared among the tests. These suites should be also be run with this command. For pure-doctest suites (without special __main__ setup code), run SPARK_TESTING=1 ./bin/pyspark python/pyspark/my_file.py. User-defined functions (e.g. lambdas or functions passed to map, flatMap) are serialized using PiCloud's cloudpickle library and shipped to remote Python workers. Serializing arbitrary functions / closures is tricky, but this library handles most common cases (including referencing objects in enclosing scopes). In this example, batched_func refers to oldfunc instead of self.func in order to avoid including self in the function closure. To ship libraries, PySpark uses Spark's SparkContext.addFile() method to distribute the libraries to the workers, where they're added to the workers' PYTHONPATHs. Data is currently serialized using the Python cPickle serializer. PySpark uses cPickle for serializing data because it's reasonably fast and supports nearly any Python data structure. TODO: discuss why you didn't use JSON, BSON, ProtoBuf, MsgPack, etc. As an optimization, we store and serialize objects in small batches. Batching amortizes fixed serialization costs and allows pickle to employ compression techniques (like run-length encoding or storing pointers to repeated objects). Interestingly, there are some cases where a set of pickles can be combined to be decoded faster, even though this requires manipulation of the pickle bytecode. Although this is a fun result, this bulk de-pickling technique isn't used in PySpark. Pluggable serialization of Python objects was added in spark/146, which should be included in a future Spark 0.9 release. The first prototype of custom serializers allowed serializers to be chosen on a per-RDD basis. The current implementation only allows one serializer to be used for all data serialization; this serializer is configured when constructing SparkContext. Even with only one serializer, there are still some subtleties here due to how PySpark handles text files. PySpark implements SparkContext.textFile() by directly calling its Java equivalent. This produces a JavaRDD[String] instead of a JavaRDD[byte]. JavaRDD transfers these strings to Python workers using UTF-8 encoding (For 0.9.0 only, this used MUTF-8 encoding, but that was fixed for 0.9.1; see SPARK-1043). Prior to the custom serializers pull request, JavaRDD would send strings to Python as pickled UTF-8 strings by prepending the appropriate pickle opcodes. From the worker's point of view, all of its incoming data was in the same pickled format. The pull request removed all Python-pickle-specific code from JavaRDD. To handle these cases, PySpark allows a stage's input deserialization and output serialization functions to come from different serializers. For example, in sc.textFile(..).map(lambda x: ...).groupByKey() the first pipeline stage would use a MUTF8Deserializer and PickleSerializer, and subsequent stages would use PickleSerializers for their inputs and outputs. PySpark uses the lineage graph to perform the bookkeeping to select the appropriate deserializers. At the moment, union() requires that its inputs were serialized with the same serializer. When unioning an untransformed RDD created with sc.textFile() with a transformed RDD, cartesian() product, or RDD created with parallelize(), PySpark will force some of the RDDs to be re-serialized using the default serializer. We might be able to add code to avoid this re-serialization, but it would add extra complexity and these particular union() usages seem uncommon. In the long run, it would be nice to refactor the Java-side serialization logic so that it can apply different interpretations to the bytes that it receives from Python (e.g. unpack them into UTF-8 strings or MsgPack objects). We could also try to remove the assumption that Python sends framed input back to Java, but this this might require a separate socket for sending control messages and exceptions). In the very long term, we might be able to generalize PythonRDD's protocol to a point where we can use the same code to support backends written in other languages (this would effectively be like pipe(), but with a more complicated binary protocol). PySpark pipelines transformations by composing their functions. When using PySpark, there's a one-to-one correspondence between PySpark stages and Spark scheduler stages. Each PySpark stage corresponds to a PipelinedRDD instance. Many JVMs use fork/exec to launch child processes in ProcessBuilder or Runtime.exec. These child processes initially have the same memory footprint as their parent. When the Spark worker JVM has a large heap and spawns many child processes, this can cause memory exhaustion, leading to "Cannot allocate memory" errors. In Spark, this affects both pipe() and PySpark. Other developers have run into the same problem and discovered a variety of workarounds, including adding extra swap space or telling the kernel to overcommit memory. We can't use the java_posix_spawn library to solve this problem because it's too difficult to package due to its use of platform-specific native binaries. For PySpark, we resolved this problem by forking a daemon when the JVM heap is small and using that daemon to launch and manage a pool of Python worker processes. Since the daemon uses very little memory, it won't exhaust the memory during fork(). Why not perform more of the processing in Java? The first (unpublished) PySpark prototype was implemented in terms of PipedRDD. This prototype represented each Python RDD as a JavaRDD[String] of base64-encoded, pickled Python objects. The goal of this approach was to allow functions like join(), distinct(), union(), cogroup(), and groupByKey() to be implemented by directly calling the Java versions. To handle these cases, JavaRDD contained routines to flatten nested data structures containing pickled objects. There are Python serializers that can guarantee the equality properties needed by this approach, but they were either slower than cPickle or supported fewer data types.